“Organic dye molecules are commonly known from color pigments or from fluorescence microscopy in biology. Although as any other molecule, they are fundamentally quantum mechanical objects made of a small number of atoms, they are usually not associated with quantum technologies, not even within the physics community. The reason is that the degrees of freedom related to internal vibrations and rotations make molecules particularly susceptible to perturbations from their environments. This compromises the coherent evolution of a quantum mechanical system. Physicists at the Max Planck Institute for the Science of Light (MPL) and FAU have now succeeded in turning an organic molecule into a nearly ideal quantum system with only two well-defined energy levels. The experiments reported in Nature Physics set an important step because they demonstrate some basic building blocks for quantum networks based on organic materials. Researchers in the group of Prof. Vahid Sandoghdar at MPL have boosted the coherent interaction of light with a single organic molecule of the polycyclic hydrocarbon family by about forty times by placing it in a microscopic optical resonator. The effect of this small structure, which is twice as long as the wavelength of light, is so dramatic that they can observe a number of fascinating effects. For example, a photon can be reflected with 99% efficiency as if a single tiny molecule were a mirror. Similarly, the team shows that a single molecule can shift the phase of a laser beam at a macroscopic level of nearly 70 degrees. A particularly exciting consequence of the experimental arrangement is that one gains access to strong nonlinearities at the single photon level. 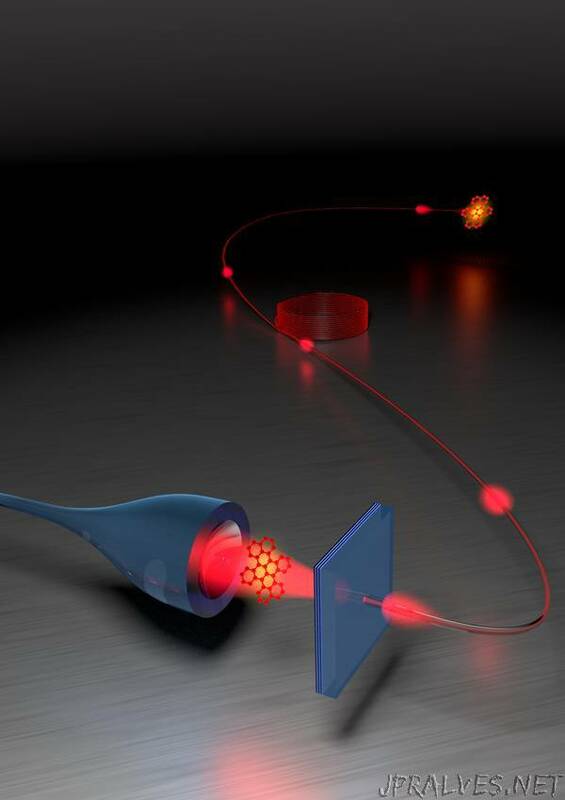 In this regime, the response of a single molecule is no longer proportional to the power of an incident optical field – rather, it responds differently depending on how many photons are impinged on it at a given time. As a result, a single molecule strongly changes the statistical distribution of photons in a laser beam. Laboratory realization of these measurements requires state-of-the-art nanofabrication to produce high-quality curved micro-mirrors and a great deal of experimental skills to prepare microcavities containing nanoscopic amount of organic crystals. Operation is particularly challenging because the experiments have to take place at -270°C to minimize the interaction of molecules with the thermal agitations of their surroundings. Despite such low temperatures, the quantum mechanical transition of an organic molecule is still compromised by more than 50%. Circulation of a photon by several thousand times in the microcavity compensates for this, making the purity of the photon-molecule coupling reach about 95%. The MPL team crowns their measurements by a true tour-de-force demonstration, where a non-classical beam of single photons is generated in a second laboratory, transferred to the microcavity lab and coupled to the first molecule, marking an important milestone in establishing quantum networks.